Antibiotic-resistant bacteria that colonize medical equipment and surfaces are causing shocking annual rises in the number of patients becoming infected in clinics and hospitals. Efforts to reduce these numbers are now carried out by a KAUST team through the usage of a smart polymer capable of changing color and activating natural antimicrobial enzymes when bacterial contamination is identified. Continuous exposure to salivary bacteria makes dental tools, such as reusable X-ray imaging plates, perfect environments for virulent biofilms. Coating devices with polymers embedded with nanoscale crystals is considered to be one solution to this problem. These nanoscale crystals gradually release silver ions, a broad-spectrum biocide agent. However, challenges existing within nanoparticle leaching, have let down the improvement of this technology. Associate Professor Niveen Khashab along with Ph.D. student Shahad Alsaiari and colleagues from the University’s Advanced Membranes and Porous Materials Center have discovered that switching to gold nanoparticles could provide antimicrobial coatings detection capabilities—these small crystals comprise of sensitive optical properties capable of being tuned to identify biomolecular interactions. However, new types of nanofillers are needed for safely incorporating the tiny crystals into polymers. Nanofillers are small chemical agents distributed in the matrix of a polymer composite. They’re dopants, so they improve on the regular material and introduce new properties—in our case, making the coating antibacterial. The team’s approach makes use of gold nanoclusters treated with lysozyme enzymes that comprise of innate defenses against pathogens, such as Escherichia coli, commonly called E. coli. The team fixed these colloids to the surface of slightly bigger, porous silica nanoparticles stuffed with antibiotic drug molecules. This gold-silica complex usually emits glowing, red fluorescent light. 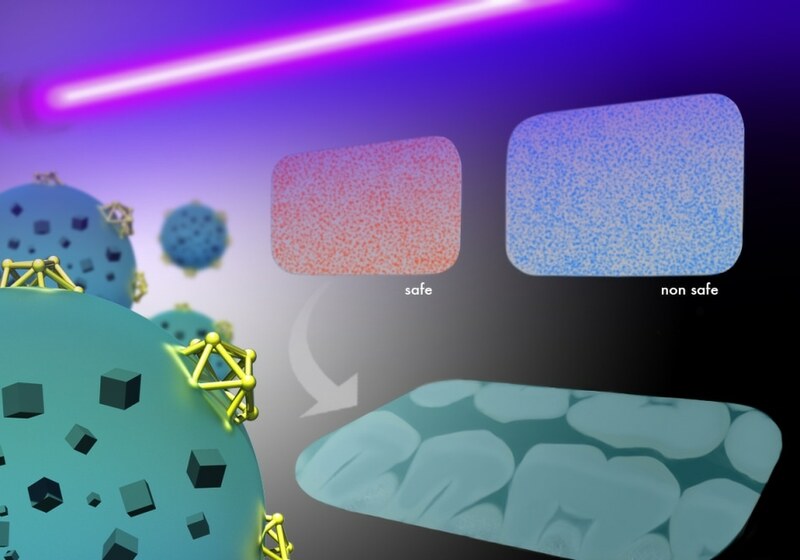 However, when the lysozyme units come across bacteria, a powerful attraction for cell walls rips the gold nanoclusters from their silica partners—an action that switches off fluorescence and releases the antibiotic cargo simultaneously. Blending experiments disclosed the gold-based nanofillers incorporated wholly into polymer composites and displayed minimal leaching during trials with E. coli. These favorable polymer interactions are attributed by Khashab to the sharp exposed edges of gold clusters on silica spheres. X-ray dental plates with and without the smart polymer coating were compared by the Researchers in order to test their concept. The same high-resolution images of teeth and bone structure were generated by both samples. However, rapid visual assessment of bacterial contamination was allowed only by the coated plate by just illuminating the device with a UV-lamp and then looking out for color change. Biofilm buildup was significantly decreased by the successful discharge of the antibacterial agent. The process of coating is easy. We are looking at improving this technology to include other medical devices of different sizes and shapes. Has the active component got regulatory approval? To the best of my knowledge, gold has no regulatory approvals for use as a biocide.